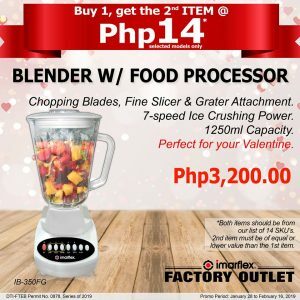 Supercharge your home and kitchen with appliances on a bargain from Imarflex Factory Outlet’s Buy 1 Get 2nd Item for Php14 . Looking for the best home solutions that will not break your bank? You are in luck! 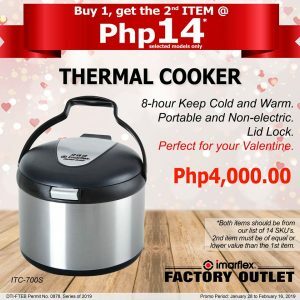 Imarflex Factory Outlet is bringing all the appliances you need to keep your personal space in order. Make housework a joy, not a chore, with huge selection of home and kitchen essentials at incredible discounted price. 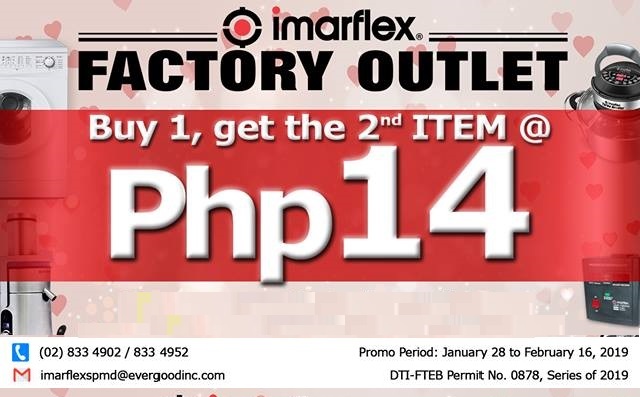 Catch Imarflex Factory Outlet’s Buy 1 Get 2nd Item for Php14 happening from January 28 to February 16, 2019 at their showroom located in Bee Lu Bldg. Sen. Gil Puyat Avenue in Pasay City. 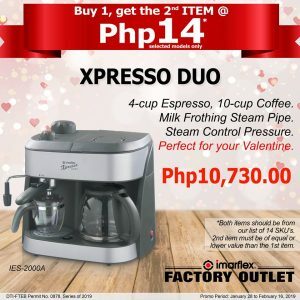 Spread the love (and the word) this coming Valentine’s Day with this special promotion just for you! 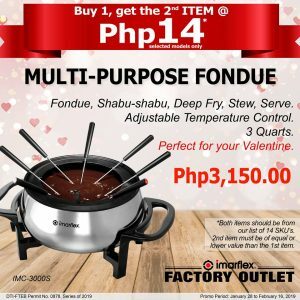 Buy one (1) item from the 14 participating items at a regular price and bring home a second item for just Php14. 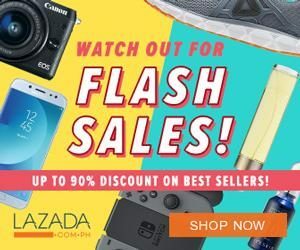 The promo is only valid at their Gil Puyat Avenue branch from Mondays to Saturdays only. Store hours are from 9:30 AM to 6:30 PM. 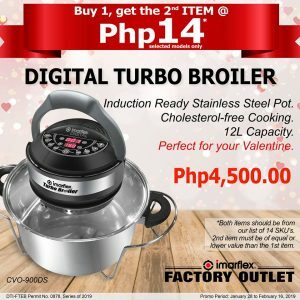 Purchase one (1) regular priced item from the list of fourteen (14) SKUs / items during the promo period. 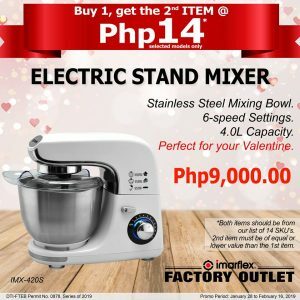 You can get the 2nd item from the same list for just Php14. The 2nd item should be the same value or lower than the 1st item. The 2nd item for PHP14 is only applicable for whose who purchased one (1) regular priced item from the list. There is no minimum or maximum quantity purchase required. For BDO, BPI and Metrobank cards only. Payments using credit or debit cards are for walk-in customers only.